I have to wonder how many of those early release books written for Drupal 7 will end up becoming trash. I’m sure they will contain useful information but things are still changing. I discovered a good video titled Date + Calendar from the Drupal Therapy guys and decided to work through their example. It goes through the steps of installing the Date and Calendar modules then creating a new Event Content Type. 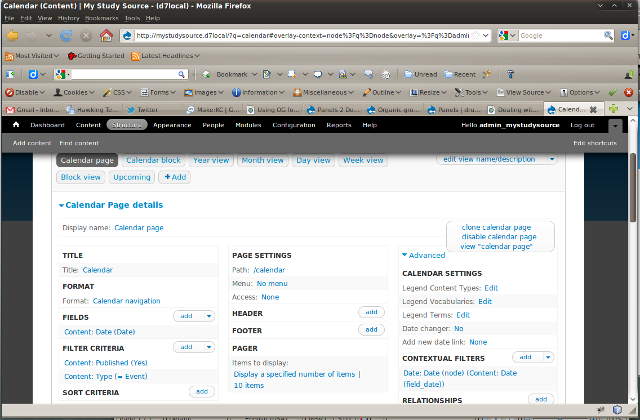 The problems started when I got to the steps they lay out for configuring the Date’s Views. It was helpful while frustrating because the Views settings page has changed so much. I finally got through the Views configuration without error messages and got the Calendar to display the correct date. As suggested, I replaced the downloaded Views, Calendar, and Date with the most recent Dev versions. In the Administration->Structure->Views page for Calendar (Content) the page layout has changed substantially from the Feb 11, 2011 date the video was originally produced (not too surprising). There is not a Defaults selection or Arguments selection on the configuration page anymore. My problem now is after the Event is published the Date and Body only show up when I select the web site’s home page. If I click on the Event article to view or edit, the published Date and Body disappear. Is anyone else having that trouble or know of a solution? (I do have Organic Groups installed in this site too if that matters).